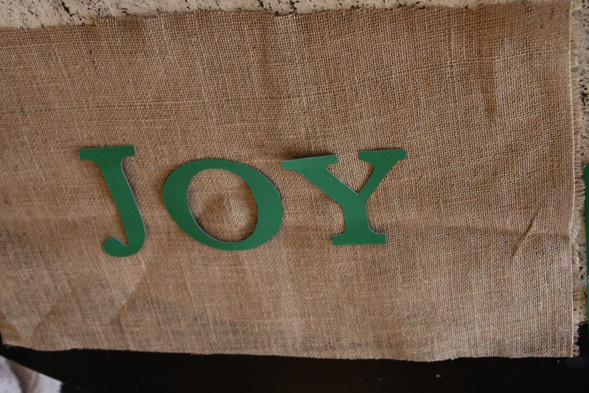 Last week I shared with you the first three out of four DIY Christmas projects that I have been working on that involve burlap. 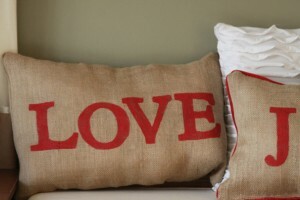 Something about the simple natural texture of burlap, makes me want to create everything that I can with it. 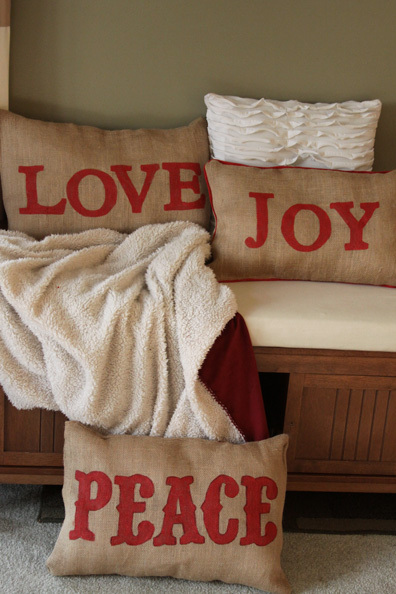 With my leftover yard or so of burlap I created three very simple, but pretty decorative pillows to add to our Christmas decor. Burlap, stuffing, thread and a sewing machine were all I needed to make these pillows, but some red craft paint and a stencil of the words Peace, Love, and Joy transformed them into a special addition to our home for the holidays. 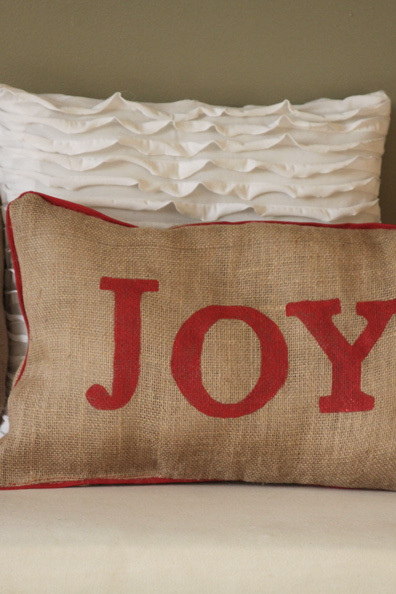 As I mentioned last week – I had a little obsession with burlap and red paint this holiday season when I started decorating. 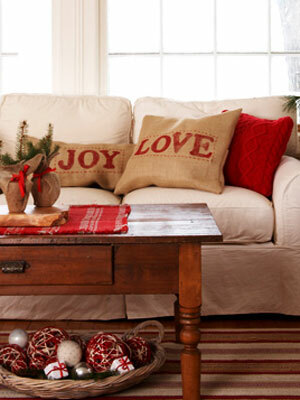 Right now I am loving things that are simple, natural and easy when it comes to holiday decor. Burlap, greenery, candle light and simple ornaments are what my Christmas decor style has evolved into. Over the last week I have showed you some simple DIY Christmas decorations that are easy things to add to your home for the holidays without breaking the bank. My final project was some burlap word pillows to add to our bench in the living room. 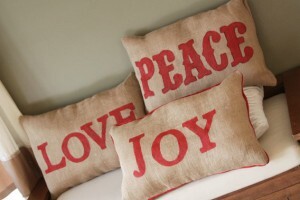 These pillows were inspired by this photo from Womans Day in a post about 12 Homemade Christmas decorations (photo credit: Paul Whicheloe/Best Ideas for Christmas. There was just nothing about this photo that I did not love, and I couldn’t wait to try my hand at making similar pillows for our home this Christmas. They turned out very well, and they add a warm, natural character to our living room for the holiday season. 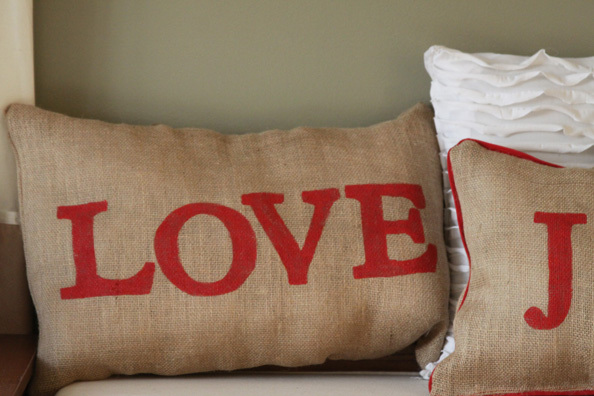 And adore the idea of the love pillow – because it can do double duty and stay out through valentines day. 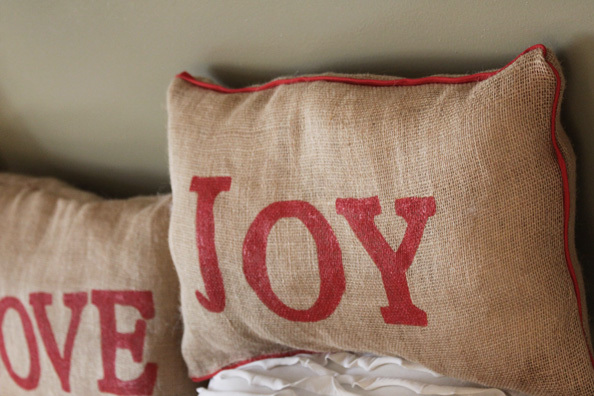 The pillows paired well with my other burlap inspired projects this winter and I could not be happier with how they look and how inexpensive they were to make myself. I don’t necessarily have a tutorial for you, and these are pretty self explanatory. 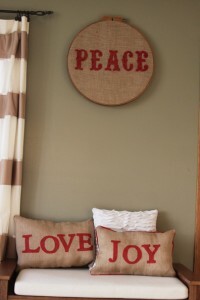 The process was very similar to the burlap peace sign I showed you last week. Basically, I cut 6 pieces of burlap all the same size. I used my Cricut machine to cut out the words Love, Joy, and Peace in the size that I needed them. You could just print and cut out letters from your computer too. I traced the letters onto the burlap, and then hand painted them using craft paint. Because these are purely decorative, I wasn’t too concerned with what type of paint I used – no one wants to rest their head on a burlap pillow – so craft paint does the trick. Once my words were dry I sewed the pillows up, stuffed them, and finished them of with a hidden stitch. The best part is that the burlap cost me all of about $4.00, the stuffing less than that, and I had the paint, brushes, and edging on hand. They turned out exactly how I had hoped and they are a simple and beautiful way to decorate for the holidays.